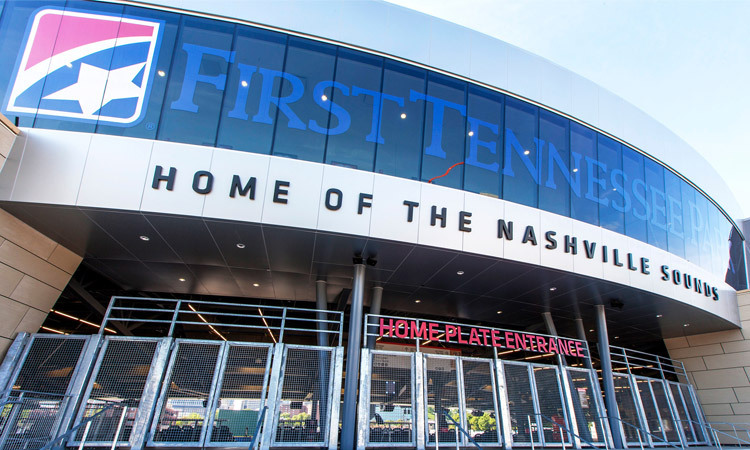 The Nashville Sounds kicked off the 2015 season in their new home, First Tennessee Park. Charlie Irwin Painting (CIP) is proud to be an integral part of the finished product, a stadium with a “major league feel” that the fans are raving about. First Tennessee Park officially opened as the Nashville Sounds new home on April 17, 2015 to a sold out crowd. Crews broke ground on the new stadium just a little more than one year earlier. CIP was tasked with completing the commercial painting of the stadium in this short one-year time frame, which only allowed for 3 months of time allotted for the full painting scope, despite inclement weather, time constraints and a host of other challenges. After Nashville officials agreed to build a new ballpark, a construction manager was selected. Then the subcontractor selection process began and deciding who would make sure the stadium was completed on time for opening day. In commercial painting, choosing the lowest bidder, doesn’t guarantee the job will be done with excellence and on schedule. Good construction managers know they need to work with companies they can trust, that have the resources and capability to work under challenging circumstances and pressure. CIP is equipped with the dedicated manpower, facilities and resources to get the job done on time and under pressure. For example, the First Tennessee Park had to be completed in less than one year. In that time, Nashville experienced an unusually cold winter with snow and ice, complicating the work schedule. However, CIP is well staffed and equipped to handle these challenges. The weather made it difficult for employees to travel to work, but because we use employees, not hired labor, they were able to get the job done using dedicated manpower, working overtime and on weekends. At the peak of the project, there were 22 CIP painters working together to get the job done. Another challenge CIP was able to overcome was a tight work schedule. Due to construction timing, the painting of the stadium lighting had to be completed in a 2-day window. 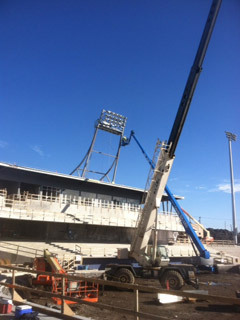 CIP had the resources and relationships needed to rent a 180-foot boom lift used to reach and paint the stadium lights. We also were able to expedite the process of painting the light towers and ladders. CIP has a 15,000 square foot facility, sitting on 11 acres in Shelbyville, Tennessee where we were able to paint a portion of the towers and ladders ahead of time, thus allowing the field portion to be completed in the 2-day window. 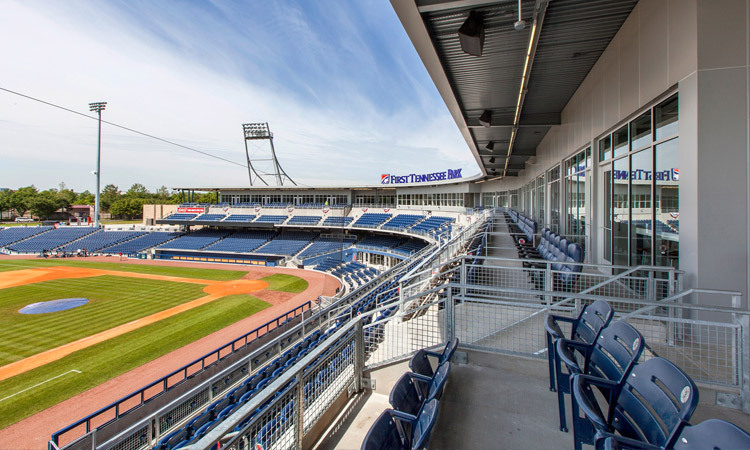 CIP worked with Barton Malow/Bell/Harmony, the First Tennessee Park construction manager, to ensure the commercial painting was done in accordance with the specifications, excellence and on time for opening day. CIP has the resources, relationships and manpower to make sure we complete jobs that meet and exceed customer expectations. First Tennessee Park is one example of the “major league” commercial painting jobs we’re proud to represent. To learn more about our commercial and industrial painting capabilities contact us here.